Richard R. Lewis of Duncan, OK passed away Friday, August 17, 2018. A memorial service will be held on Saturday, September 22, 2018 at 11:00 AM at Elk Avenue Church of Christ with Robert Teague officiating. Services are under the direction of Don Grantham Funeral Home. He was born June 19, 1933 to John and Susan (Meador) Lewis on his grandfather's farm east of Amarillo, Texas. (Part of what is now Amarillo International Airport.) His early years were spent in west Texas and eastern New Mexico where his parents were school teachers. This was during the Great Depression and they faced many hardships. Richard remembers living in a dugout (a hole in the ground) at one point. During World War II the family moved to Long Beach, California when his father got a job with Douglas Aircraft as a machinist. They were members of the Lynnwood Church of Christ where Richard was baptized into Christ by Brother Phillips in 1944. One Sunday morning as they were preparing for services Susan's housecoat caught fire. She ran out of the house and Richard ran after her, rolling her on the ground to put out the fire. However, she was badly burned and died a short time later in the hospital. John married Ruth Pirtle, one of the single ladies at Lynnwood and in 1948 they moved to Phoenix, Arizona where Ruth's family lived. They were members of the 5th Street and McKinley Church of Christ where Richard benefitted from the teaching of great preachers such as Carrol Christmas. It was there that Richard met his future wife, Imogene Orick, daughter of Paul and Juanita Orick. Richard and Imogene were married December 18, 1953. They moved to Texas to attend the Amarillo Bible Training Work and prepare themselves as workers in the Lord's Church. In Amarillo Herbert and Tiny Gibson took them under their wing. Returning to Phoenix, Richard worked as a carpenter and with the Phoenix area churches, preaching, teaching and leading songs. Richard was a builder, constructing homes, offices, hotels, factories, etc. all over the valley and in such far off places as Yellowstone National Park, the Navajo Indian Reservation, California, Colorado, New York and Oregon. Richard was a man of faith and vision. When the need was seen to establish a congregation on the (then) northwest side of Phoenix he played an important role. Richard was "in on the ground floor" as he and brother-in-law, Dan Orick, were commissioned by the leaders of the 5th Street and McKinley church to locate suitable property for a new congregation. When the first building (now the Family Center) was built Richard joined his expertise as a carpenter with the construction experience of other members to complete the building in 1957. Richard and Imogene were founding members when the Black Canyon Church of Christ was begun in 1956. For the first several years he served as the church's part-time preacher. In 1963 Richard again provided his construction expertise to join with other members in building a new facility which was completed in 1964. The new building quickly became a Phoenix "landmark" known as the "white church with the white steeple". Richard, with Imogene by his side, provided a stable and strong foundation for the new congregation. They contributed their time, talent, effort and finances to support and grow the church. When the church doors were open they were present. When the church had Gospel Meetings or "dinner on the ground" (we now call them Fellowship Lunches) or singings they were there. With his construction experience and contacts Richard has provided much of the expertise, manpower and goods to "keep the buildings and grounds running." Of even more value through the years Richard preached, taught home Bible studies, led singing, gave singing instruction and helped the church in numerous ways. He was instrumental in the Youth Meetings held annually at Black Canyon for many years. Richard was also very involved as the church hosted the “Festival of Praise” song fests during the meetings. These song fests featured groups from California, Arkansas, Arizona, Oklahoma, Texas (and perhaps elsewhere). Richard served the congregation as an Elder from 1981 to 2008, when he resigned due to health reasons. 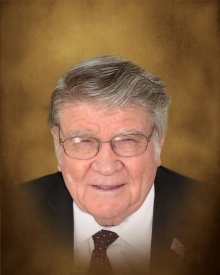 Richard was a man of faith and vision who devoted more than fifty-seven years of faithful commitment and service to the Black Canyon Church of Christ. Richard was preceded in death by his mother, Susan; father and stepmother John and Ruth Lewis; and his wife, Imogene. He is survived by four children; Rick Lewis of Phoenix, AZ; LaFonda Britton (Phil) of Duncan, OK; Victor Lewis (Debbie) of Phoenix, AZ and Nathan Lewis (Audra) of Grapevine, Texas, sixteen grandchildren (13 are married), and 27 great-grandchildren. He is also survived by one step brother Tom Lewis (Jeanette) of Carlsbad, NM and numerous family and friends. Richard devoted his life to the Lord, His Church and his family.